Are your hardwood floors looking dull? Have they lost that clear, crisp look they had when they were new? Most people dust mop their wood floors and use spray cleaners to keep them relatively clean, just like vacuuming a carpet regularly; while this helps, you never remove all of the dirt and other contaminates from your floor with a dust mop, and many cleaners trap these elements causing your wood’s finish to become cloudy and dull. The heart of this cleaning process is our professional wood floor cleaning machine. This machine applies a solution specifically to intensively clean wood floors and then vigorously scrubs your floor removing dirt, grease, and other contaminates that a household floor cleaner won’t remove, capturing the dirty solution in its recovery tank. Your floors are now clean and contaminate free. If you choose, we can apply a coating in matte or gloss finish to give your floors an extra layer of protection and a new sheen. You can have this new finish on your floors in hours, not days. 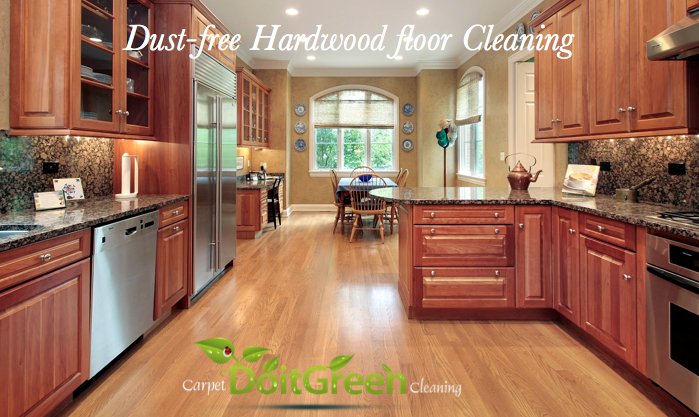 If your hardwood floor is not severely damaged or neglected, as is the case in about 98% of the floors we see, it is a candidate for our professional deep cleaning. Enviromentally Friendly – Low VOC omissions, biodegradable products, and no chemical residue. No Mess – Eliminates the dust, noise, and odors of traditional methods. Fast – you can walk on the hardwood floor in a few hours, (with socks or soft slippers).